There is a character to the ocean, to the open sea itself, in its light and theatre, which simply cannot be captured in coastal waters. At the interplay of land and sea the shallower water has different wave heights and seems to hold colour differently. On a vessel in mid-sea hoewever, there is a novel theatricality to the whole setting which creates so many new and interesting challenges to the artist. 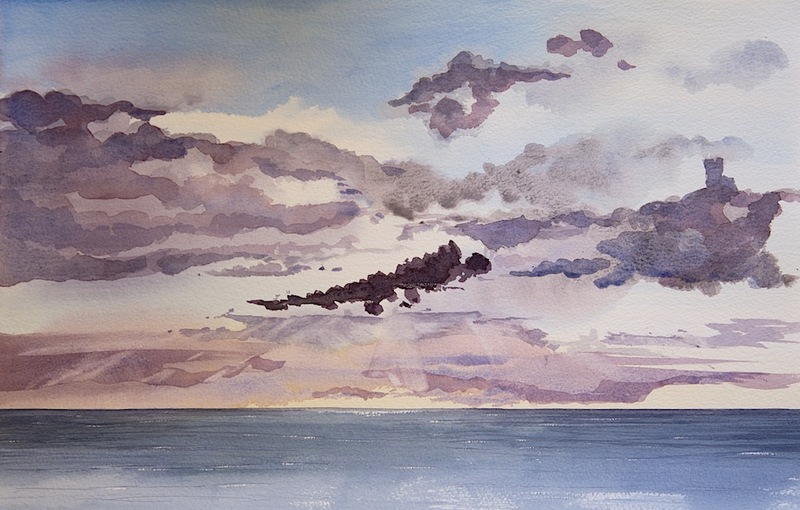 This watercolour was finished ashore from field sketches and photos of the North Sea, approximately 200 miles off the coast of Norway. As the sun set at dusk it would fleetingly create a series of dramatic tableaux, where clouds would be brilliantly backlit in the oranges and purples so characteristic of a northern sun.